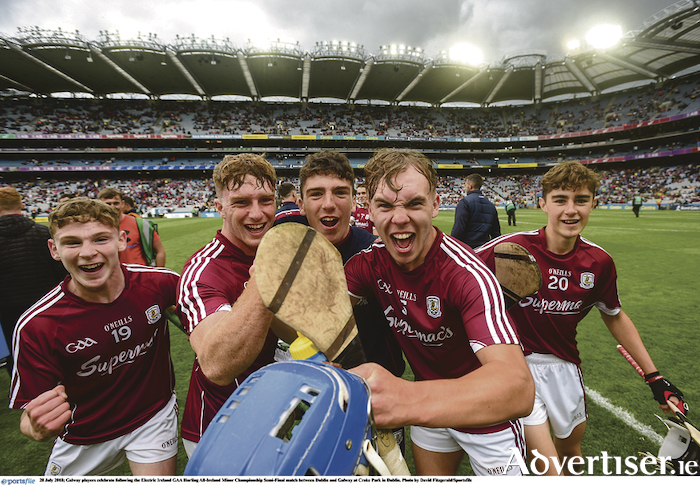 The Galway minor hurlers under the guidance of the experienced Jeffrey Lynskey will be in action against Kilkenny on Sunday 19 August in the All-Ireland final after an impressive 3-22 to 0-16 win over Dublin last Saturday at GAA headquarters. Donal O’ Shea was in superb form from the placed ball at full-forward and hit 0-12 (all frees ) over the hour, while Niall Collins hit a crucial goal just before half-time that seemed to knock the stuffing out of the sky blues. The first half had been a tight and keenly contested affair, however Galway really opened up the Leinster men in the second half with further goals from Adam Brett and Dean Reilly and never looked like being caught. Gort’s Jason O Donoghue really took control around the middle in the second half and Diarmuid Kilcommins also chipped in with two points to push Galway into a commanding lead. Full-back Shane Jennings had a really powerful game on Dublin’s danger man Luke Swan and in the end Galway romped home by 15 points to ease into what will the county’s fourth All-Ireland final in five years. Galway have already beaten the Cats at this age group this season and will start the final as favourites.